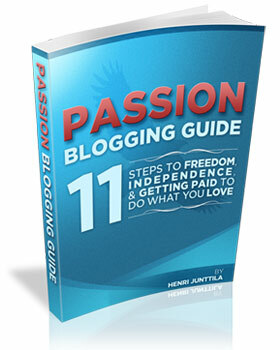 Passion Blogging Guide: Are You Ready to Get Paid to Do What You Love? Let me introduce you to the Passion Blogging Guide. It tells my journey of how I went from zero to thousands of subscribers within less than 12 months. More importantly, it offers 11,000 words of free advice on how to create a profitable blog, and start making money doing what you love. Aspiring world changers who want to get paid to do what they love, specifically through blogging. It doesn’t matter if you’re just starting out (i.e. don’t have a blog yet), or have been blogging and aren’t seeing the results you’d like. It even contains a little something for more seasoned bloggers (specifically the part about Article Marketing Magic). How to Find Your Passion, Fast! All you have to do to get the guide is click the link below and download it. There’s no opt-in, no hooks, and no catches. However, I want to ask you a favor, and that is to share this guide with your friends via Twitter, Facebook, email, or in whatever way you wish. It’s all yours to share, for now. I have plans on making this a paid guide, so make sure you download it now, while you still can. Click here to download the Passion Blogging Guide. As you were kind enough to send me a sneak preview, I just want to let your visitors know that this really is a remarkable guide about blogging and how to use it to fuel your passion and make money doing what you love. I haven’t seen a guide like this before and it’s totally worth downloading, even if you know a fair amount about blogging already. Thanks a lot, Diggy. I really appreciate the kind words, and you taking the time to read the guide. This guide is a really great place to start learning about blogging AND for those people like me who have been doing it for a while. I was also grateful enough to be one of the one’s who got a sneak peek and I must say it’s a great read. Mainly I just really enjoy reading your writing but more than that, the book has a lot of really useful information that anyone looking to do something better and change the world by doing so will love. Excellent guide Henri, and congratulations for completing another book! I like how it’s written by giving ideas and possible solutions in “find out what works for you style”, but still stressing the definite no-nos through your personal experiences. I have signed up for the newsletter and I’m interested in what you have to say in the ebook. Looking forward to read it. Have fun, Vincent! And do let me know if you have any questions! Keep moving forward. Fail a lot, and learn, and you’ll do just fine! Wow, that was a great job henri. Have started going through it already and i’m loving every bit of it. The time you’ve invested in putting it together will not be wasted. I must confess that i really appreciate your work. More grace. More knowledge. Bigger dream. I like how you kept it simple, straightforward advice for someone like me who is just starting out. I bought my domain about a month ago, and got going, but am still a little lost. Your Passion Blogging guide definitely helped give me direction in how I can grow my blog and maybe make a little money through it as well. I’m glad you enjoyed it, Melissa! Loved the Passion Blogging Guide! Very easy to follow, and very well laid out, with excellent suggestions and advice throughout. You definitely have a talent for writing easy to understand ebooks and guides. Thank you for sharing so much quality information. You are very kind, Mary. Thanks! Thanks, Henri, for making this available. I have an interest in writing but have just been dreading “having to” write for business. I look forward to this helping be the boost that I need to get going.